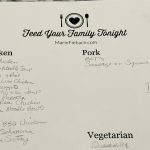 In this episode we start talking about the Feed Your Family Tonight 3 step process for weeknight dinner success. I call it my PSA after the “Public Service Announcements” of the 1980’s. Step one is “P” Plan and Prep. 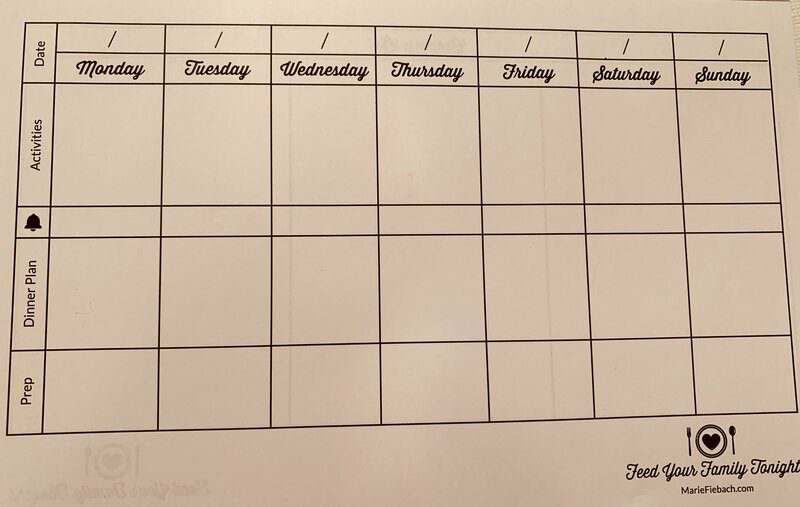 The Weekly Meal Plan Sheet is where we start the process. You can get your copy here. 1- List your afternoon and evening activities on the Weekly Meal Plan Sheet. When you plan your weekly meals you need to first think about what your evenings are like. Are you running from piano to soccer to a meeting at school? Maybe you have one night this week without any activities. The kind of meals you plan need to work around your schedule. 3- Think about the other “P,” Prep. What can you do today to be successful later in the week. I talk about prepping chickens to roast. I prep them while doing dinner dishes on Tuesday so all I have to do on Wednesday is put them in the oven. You can see a video about how I prep chickens here. The recipe is in my cookbook. I like to do my prep when I am cleaning up dinner. This is when I take meat out of the freezer for later in the week or get things ready to put in my slow cooker the next morning. Write the prep you need to do on the day you plan to prep. For more support and to talk about this week’s episode, join the Feed Your Family Tonight Facebook group.